Don’t let that keep you away from these fun socks. 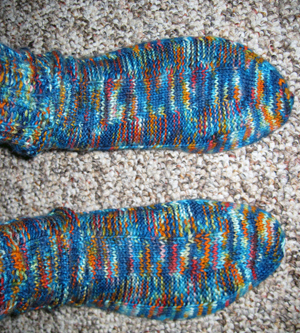 Knit in worsted weight yarn, they are a fairly quick project. I used the suggested yarn, Knit Picks’ Chroma Worsted. Want to see the nitty gritty on the socks? Check out my project details at one of the sites below. A few weeks ago, my husband and I were at our local Barnes and Noble rummaging through the clearance books. One book caught my eye. It was Stupid Sock Creatures by John Murphy. I was intrigued. I bought the book. At a couple of bucks, why not? Besides being an utterly hilarious book, Murphy provides concise and clean directions on how to create your own stupid sock creature. 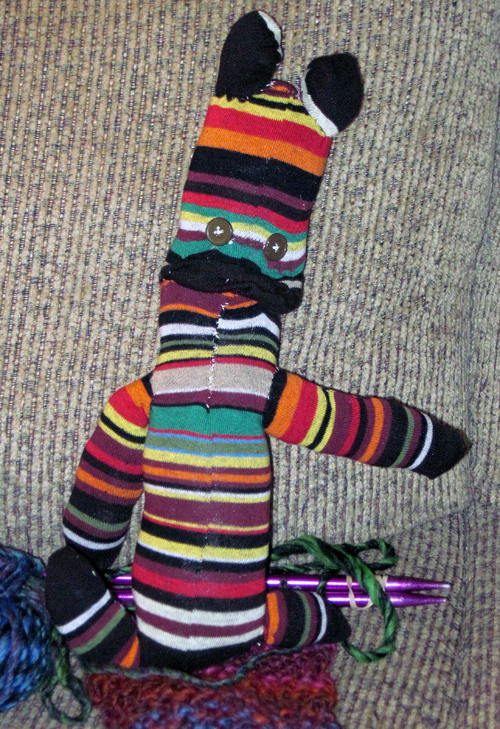 Now, I’m not the best at following sewing directions, but I managed to eke out my own sock creature. See him here? His lips and legs are screwy, and not quite in line with Murphy’s creatures, but he’s not bad for a first attempt. Besides a being a sock creature creator, Murphy also sculpts, writes and is a great cartoonist. In the back of the book is a comic featuring some of his creatures in a hilarious adventure. My favorite is Jordan. My creature is based off of Jordan’s pattern. Stupid Creatures is Murphy’s web site, and has a new sock creature book coming out in October. I will be buying it. He also has a few other books available for sale, as well. Look at the t-shirts, too. Oh, and I haven’t figured out a name for my sock guy yet. Any suggestions? My first real sock! Huzzah! Yes! My first real, turned-heel sock! It wasn’t as scary as I thought it would be! I just followed the directions, took my time, and soon I had a sock! On to sock number two now….. 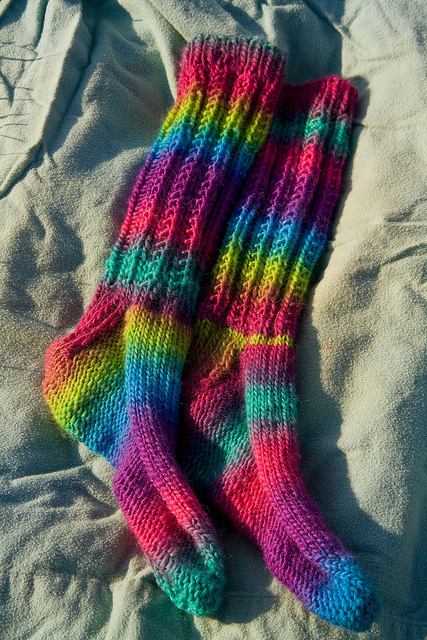 I am knitting two pairs of socks for my friend, Chester as a part of a trade/swap/payment thing. It was the perfect time to learn how to turn a heel. I am quite proud of myself and am looking forward to starting the second sock. 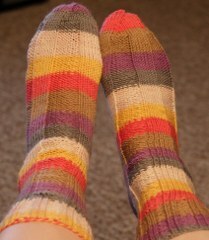 I finished my Doctor Who socks with the Felici Time Traveler yarn from Knit Picks. They are comfy and have delegated to bedtime socks as they just tube socks. I love the self-striping and the colors. I do miss the green that was originally in Tom Baker’s scarf, but I appreciate Knit Picks’ thoughtfulness as a way to have a product that appeals to us sci-fi nerds and Whovians. Other news! A friend of mine, Kristin, as a new blog called “What Would Carolyn Ingalls Do?” and it focuses on frugality and a DIY lifestyle, with a splash of family friendliness and warmth. Kristin teaches, crochets, and plays a mean clarinet. Go check her blog out! More news! I was published again in Squidoo’s online vegetarian magazine GoodVeg as a fill in writer for the Veg O’ the Week column. I wrote about avocados. I know a lot about avocados now. Head on over to the article to learn what I learned about this yummy vegetarian delight. Rats, I’m not going to be able to go back to the PA Renaissance Faire this year, but I did make some lovely socks from that lovely sock yarn from the KareDan Farming Initiative! They are just tube socks, but here are my feet modeling them. I wear them to bed because they are so soft and comfortable. And they perfect for Socktoberfest! Again, thank you to KareDan Farming Initiative for promoting a healthy lifestyle and for selling quality products. 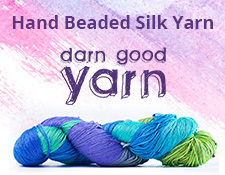 Their yarn was a pleasure to knit with and I loved seeing how the colors became marled together. Now onto my Doctor Who socks!